My recent relocation back to Southeast has opened up many new track day possibilities, from VIR to Roebling Road to Barber, but chief among all the tracks I hoped to take a crack at was Road Atlanta. Road Atlanta continues to rank high on many motorsport journalist’s and racer’s lists of great American race tracks, and there’s no reason why a wannabe racer and track-day enthusiast like myself shouldn’t aspire to this famous course. During my short time driving tracks in Texas I had already had a couple instructors mention that Road Atlanta was their favorite track, so expectations were high. While Road Atlanta is still on the calendar of a few major series, such as Tudor, it also plays host to a wide variety of amateur racing organizations and track day events. NASA, SCCA, PCA and CCA all visit at least once per year and Chin Motorsports makes it one of its regular stops. Through a Sandlapper (South Carolina) Chapter monthly newsletter, I had found out about an upcoming DEevent to be held in conjunction with “Racerfest”, a large gathering of CCA Club Racers held each year at the Braselton, GA track. I jumped at the chance and immediately registered for the event, which was organized by Georgia’s Peachtree Chapter of the BMW CCA. 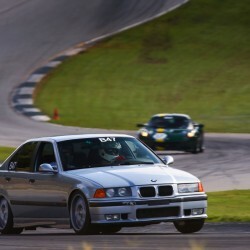 I decided to take the M3 rather than the M Coupe, as I had heard that Road Atlanta wasn’t nearly as forgiving as the majority of Texas tracks and I couldn’t bear the thought to sending the Coupe backwards into a concrete wall. Either car would need a little work to get track-day ready, mainly swapping in some performance pads (PFC 08s) and general maintenance checks. One thing led to another and I ended up completely rebuilding the brakes, replacing the giubo, installing new tires, and getting a fresh alignment! The end results was a very capable street car, one that ended up being truly balanced. More on the car later. Road Atlanta sits about 50 miles north east of downtown Atlanta, its mailing address placing it in the small town of Braselton, GA located off of I-85. 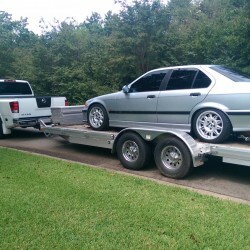 Since it would be a three hour drive from my home in South Carolina, and I didn’t want to risk being stranded in the event of a mechanical failure (or worse), I decided to trailer the car. There isn’t much in the way of amenities near the track and hotel selections were a bit limited. I ended up at the Best Western in Braselton, which certainly wasn’t the nicest place I’ve stayed but far from the worse. Driving a bit further north towards Gainesville will net you more variety in lodging and restaurants. I arrived at the track on Friday evening, just in time to get registered, unload the car, and park the trailer. It’s always nice to arrive a bit early to get a better choice in parking. I always find it’s a bit of a guessing game when parking the car and trailer if the other cars and trailers around you are unattended and no cones to warn you of claimed asphalt. 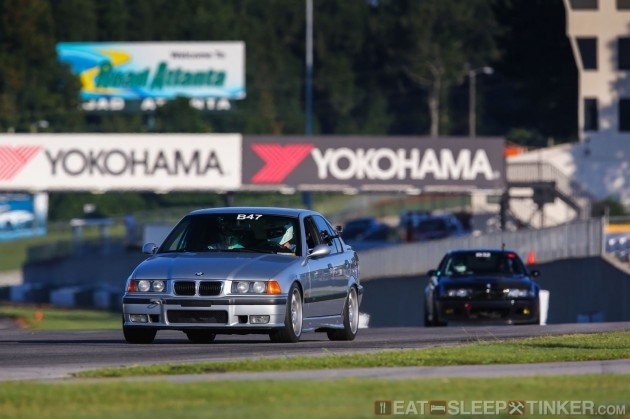 I squeezed in between a Super-Mod hauler and I-Prepared E36 as best I could, as most of the racers had arrived earlier and were qualifying and even racing on Friday. Coming from Texas tracks, seeing Road Atlanta for the first time is a bit of a shock. In mostly flat Texas, void of large trees, you can see the majority of the track with the naked eye just standing in the paddock. Road Atlanta, like Barber, winds its way through the pines. There is also a lot of elevation change, which means you really only see the dive coming down from the bridge at T11, the T12 sweeper, the front straight, and T1. You have to get in a car and drive around the track to see much else. The paddock itself is also a bit oddly shaped and not flat like most in Texas. Of course we were only using one of the two large paddocks, this is a pro-racing venue after all. The event put on by the Peachtree Chapter was very similar to the CCA events I’ve attended in Texas. The day started with a standard drivers meeting, albeit a good deal shorter than I’ve become accustomed to. There wasn’t any flags review or other basic information, I assume they leave that up to the classroom instruction or for the instructors. Fine by me, it gets a little old hearing the same thing, but sometime different organization have different meanings for things like white flags or black flag procedures. From what I gathered, this event wasn’t open to pure novices. There were four run groups, C (intermediate), B (advanced or intermediate+), A (Advanced or Advanced+), and of course the instructors group. 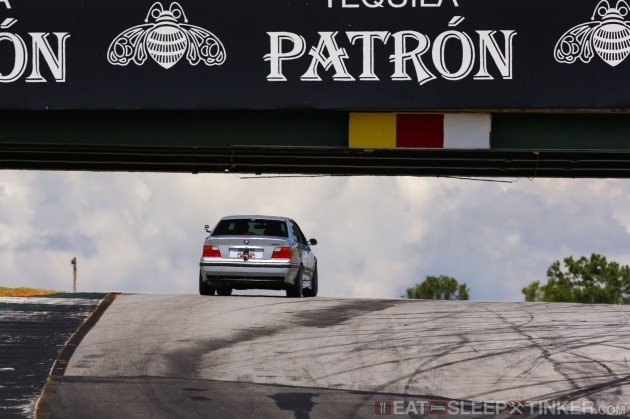 This was first time at Road Atlanta, and I had registered via MotorsportReg.com just like I had with the Texas events, so my track experience was available to the organizers. I wasn’t sure where they’d place me, I just hoped that it was in a group that allowed solo’ing and open passing, as long as I got an instructor to show me the line and any hazards. At registration I found out I was in B group, handed two vinyl “B”s and two “47’s. I like how the Peachtree guys have the legible classification and car numbers, with one on the front windshield and the other on the right side. I’m sure it made life easier on the corner workers and photographers. My group was up first, almost immediately after the driver’s meeting, so I headed quickly back to the car to get everything prepped. Same process as every track day, clear out the car of loose items, check the fluids, torque the wheel bolts, check the tire pressures, install the CG-Lock, tape the Bluetooth GPS to the dash, get the Android phone setup for data, and of course the GoPros. I threw on my AlpineStar shoes, Simpson helmet and gloves then headed down to the grid. The organizers were very good about making 10 and 5 minute warning calls over the PA, and everything ran on schedule to the minute. Unfortunately a little miscommunication somewhere along the line left me waiting in the grid for my instructor, so I got shorted a bit on the first session. Fortunately, I had a very good instructor, and after that first little mix-up we didn’t have any other issues. Like most organizers, finding enough quality instructors can be a challenging, it seemed most of the ones present were double stinting with a C student. My first session out was definitely an eye opener. Most of the track is pretty easy to pick up quickly, not that I mastered it by any stretch of the imagination. But that turn 11 under the bridge is a real clincher the first few times you go through it. I’d watched numerous YouTube videos of this track, so I wasn’t completely caught off guard, but it doesn’t truly prepare you for the sensations you experience. After T10A & B it’s a climb up a hill that hides the diving right hander of T12 on the opposite side. There are two pit entrance on both sides of the course just after the bridge to make things even more confusing. The first few times I came over the crest I had that feeling I was pointed in completely the wrong direction, probably because I was. T12 also tracks out right towards the support paddock pit wall, and walls certainly raise the stakes. As the day wore on, I found you could go down through T12 much faster than I originally thought (and I’m sure much faster than I dared drive.) It was pretty telling that I had never ran out of revs in 4th at the end of the straight on day one (~110mph) but early on day two I was hitting the rev-limiter further and further from the beginning of the brake zone. I wish I had tried a bit of a short shift to fifth, as I was leaving speed on the table by lifting prior to the braking point for T1. T1 is another fast right hander than begins the climb back up hill. My instructor was good about pointing out reference points, like a group of trees or a corner worker station. T2 is a shallow left hander, no braking required, still in 4th gear. T3 is tighter, with a piece of curbing at the apex that has clearly become a short cut for many cars. It requires a hard but short brake application and downshift to third. I began edging my inside tires further and further up this curbing over the weekend, to the point both tires were leaving the ground. I’m not sure how much faster it was, but I had to be careful to not upset the set too much. T3 is over in a blink and back on the gas, hugging the inside of T4 as it winds to the left and down into the essesses. Unlike the essesses at COTA, where you are slowing down going through them, these essesses have you accelerating all the way down and then back up. It requires an upshift to 4th, which I was taking as I rounded T4. T5 requires a moderate amount of brake. I found myself taking less and less every subsequent lap. It’s going back up hill, so you have the track helping to slow the car as well. I downshift prior to this turn back to third. T5 isn’t particularly fast, but generally this where traffic begins to back up if you get caught behind a slower car going into the essesses. Since it’s uphill and a braking zone, cars tend to bunch up a bit. Good news is that leads onto a straight, so generally you can get a pass, even if you are several cars back in the train. Of course your lap times will suffer a bit not getting a great run out of T5, but hey, this isn’t racing right! The track out area is also very wide, though much of it is rumble strip. Depending on traffic and how fast I made it through T5 really affected just how much rumble I took. At one point I used it all and a little red Georgia clay as well! T5 to T6 is a short straight, with an upshift back to fourth about midway down it. The first time I took T6 I braked and downshifted back to third, until my instructor suggested I stay in fourth. I found that T6 was one of those deceivingly fast corners. It’s a 90 degree corner, but it feels very much on camber. It’s a right hander, but it felt kind of like COTA‘s left hander T19. Both require braking, but not a great deal (at my relatively pedestrian speeds) and you can carry a good bit through it. The course straightens just a short distance after T6, giving you enough time to straighten the car position it on the outside for a hard brake and downshift to third for T7. T7 is one of those corners that really frustrates me. It’s slow and leads to a long straight, the longest at the track. It felt a bit like T20 or T11 at COTA. You come into it a decent clip, have to slow significantly then power out of it. 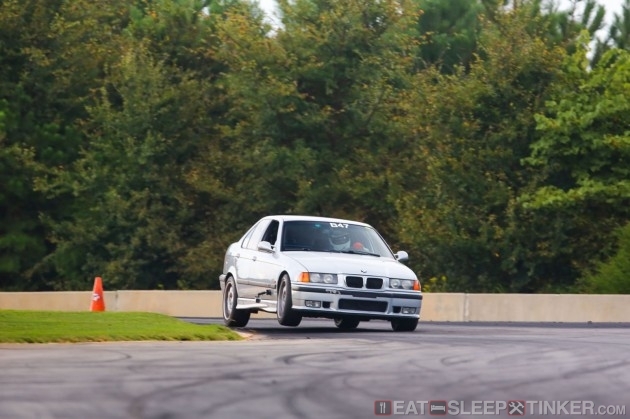 The E36 M3 isn’t a powerful car by today’s standards, not by a long shot. So I found myself either feeling like I was bogging coming out in third or having to do a quick shift from second (and increasing chances of a mis-shift, which did occur when I tried it.) Occasionally traffic would necessitate a downshift to second, but the majority of the time I kept it in third and just hoped for a good run out of T7. I had similar difficulties with Diamond’s Edge at MSR-Houston. Like T5, you’ll see some traffic bunching up coming into T7. Coming onto the straight you’ll have to use common sense on passing, as often this is where a less powerful car will have a difficult time passing a fast car that isn’t being driven through the corners quickly. As an example, I let an Exige by, as he was easily catching me in the corners. But down the straight I was on partial throttle as to not catch him back up. 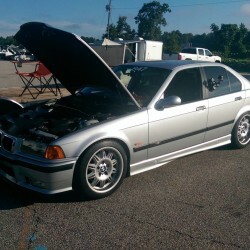 I had the favor returned by some E46 M3s and E92 M3s who obviously could walk me on a straight. 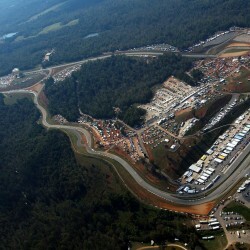 Like the back straight at COTA, the back straight at Road Atlanta isn’t completely straight. It bows to the left and then back to the right, before dropping down to T10A. I found myself hitting about 125-128mph before reaching the brake zone for T10A. The road surface is going away from you, so a little earlier braking is prudent. At least there’s a nice big sand trap to catch you if you mess it up. T10A and T10B is a left-right chicane, which begins to rise sharply towards the aforementioned bridge T11 turn. The track managers were nice enough to add some colored squares to the middle of the bridge, providing a good cue of where to place your car as you come up the blind crest. Concrete bridge abutments add to the thrill, especially if you happen to blow a power steering line and lubricate your left rear tire under load. You can’t really see T12 until you are under the bridge. My first couple of attempts placed me too far right, not where you want to be. Turning in early here is definitely a bad thing, fortunately those mistakes were made far from the traction limits and I could correct. Doing it correctly gives you the feeling that you’re going to head right into the grass at the outside edge of the turn. I found myself looking for where the majority of the rubber had been laid and using that as my line. T12 spits you out at the track edge just beyond the start/finish bridge and that seemingly very close pit wall. Fortunately the track surface felt very grippy. I was pleasantly surprised by how smooth it was and how much traction I was getting out of the Michelin Pilot Super Sports, and I was really working them. Given the track’s vintage, I was expecting it to be bumpy and polished slick. Of course I only experienced it in the dry, but compared to the majority of tracks I’ve driven, Road Atlanta is right up there with COTA when it comes to smooth surface with lots of grip. At the end of day one on Saturday, my instructor said I was good to solo. I always enjoy getting some solo time, as it frees up the mind a bit. Even with a really good instructor, which I had, you still are a little distracted by having another person in the car, not to mention the added weight. The following morning he rode with me for the first session, which is apparently a chapter requirement to have an instructor on the first session, then handed me my solo sticker. I spent the last three sessions knocking a bit more time off, topping out at a 1:50.75. I have no clue whether that’s a respectable time for this car and my first time at the track, but it felt pretty good. As usual, I came armed with several GoPro cameras and did some data acquisition with the phone running RaceChrono Pro. Here’s one of the longer runs from Sunday, replete with fancy title graphics. And another one from the last session on Sunday, this time with the main video captured from inside the car. 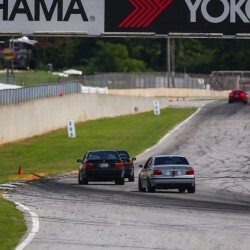 I have to say that my expectations for Road Atlanta, which were high, were all met or exceeded. While it doesn’t have that new track smell and pretty painted run-offs like COTA, it instantly became my favorite track. The combination of turn variety, high speed sections, grippy surface, and mostly the huge elevation changes make it a very fun and rewarding challenge. 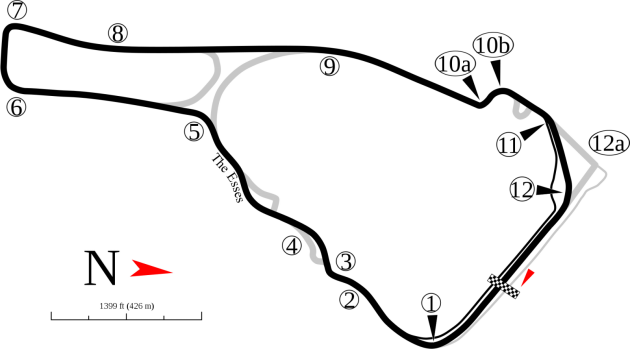 I easily rank it the highest on my short list (in no particular order: Pacific Raceway, MSR-Cresson, MSR-Houston, Harris Hill, NOLA, and COTA.) I highly recommend you check it out if given the opportunity, and there are plenty right now with Chin, CCA, PCA, NASA, SCCA, and others who regularly visit throughout the year.